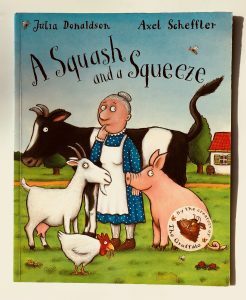 Once upon a time Julia Donaldson wrote children’s songs and ‘A Squash And A Squeeze’ was one of the most popular. She was contacted by a publisher who wanted to turn the song into a book and the rest, as they say, is history! She realised that her rhymes were perfectly suited to books and a legend was born. The story is about a little old lady who complains that her house is too small. She asks a wise old man for advice and mayhem ensues as her house slowly fills with animals and seems even smaller. What is the wise man’s plan and will it work? Ivy loves this one and it’s my go-to book if she’s upset because it never fails to make her laugh.